I just installed apache2, php, mysql, phpmyadmin, and vftpd (to add files via filezilla) on my raspberry pi, which is used as a local web server. I created a simple index.php page with Brackets (a php file editor). I uploaded it to the /var/www/index directory, but when I go open a web browser, the file is a white page! It seems it doesn't recognize the php file. drwxr-xr-x  3 pi   root 4096 nov.  29 16:56 .
drwxr-xr-x 12 root root 4096 nov.  29 15:32 ..
192.168.1.76 - - [29/Nov/2015:16:43:59 +0100] "GET / HTTP/1.1" 200 23783 "-" "Mozilla/5.0 (Macintosh; Intel Mac OS X 10_10_5) AppleWebKit/601.2.7 (KHTML, like Gecko) Version/9.0.1 Safari/601.2.7"
192.168.1.76 - - [29/Nov/2015:16:44:03 +0100] "GET / HTTP/1.1" 200 23783 "-" "Mozilla/5.0 (Macintosh; Intel Mac OS X 10_10_5) AppleWebKit/601.2.7 (KHTML, like Gecko) Version/9.0.1 Safari/601.2.7"
192.168.1.76 - - [29/Nov/2015:16:44:04 +0100] "GET /mysql.php HTTP/1.1" 404 505 "-" "Mozilla/5.0 (Macintosh; Intel Mac OS X 10_10_5) AppleWebKit/601.2.7 (KHTML, like Gecko) Version/9.0.1 Safari/601.2.7"
192.168.1.76 - - [29/Nov/2015:16:44:05 +0100] "GET /mysql.php HTTP/1.1" 404 506 "-" "Mozilla/5.0 (Macintosh; Intel Mac OS X 10_10_5) AppleWebKit/601.2.7 (KHTML, like Gecko) Version/9.0.1 Safari/601.2.7"
192.168.1.76 - - [29/Nov/2015:16:44:09 +0100] "GET /lol.php HTTP/1.1" 500 187 "-" "Mozilla/5.0 (Macintosh; Intel Mac OS X 10_10_5) AppleWebKit/601.2.7 (KHTML, like Gecko) Version/9.0.1 Safari/601.2.7"
192.168.1.76 - - [29/Nov/2015:16:44:10 +0100] "GET /lol.php HTTP/1.1" 500 187 "-" "Mozilla/5.0 (Macintosh; Intel Mac OS X 10_10_5) AppleWebKit/601.2.7 (KHTML, like Gecko) Version/9.0.1 Safari/601.2.7"
192.168.1.76 - - [29/Nov/2015:16:45:15 +0100] "GET / HTTP/1.1" 200 23782 "-" "Mozilla/5.0 (Macintosh; Intel Mac OS X 10_10_5) AppleWebKit/601.2.7 (KHTML, like Gecko) Version/9.0.1 Safari/601.2.7"
192.168.1.76 - - [29/Nov/2015:16:56:32 +0100] "GET / HTTP/1.1" 403 518 "-" "Mozilla/5.0 (Macintosh; Intel Mac OS X 10_10_5) AppleWebKit/601.2.7 (KHTML, like Gecko) Version/9.0.1 Safari/601.2.7"
192.168.1.76 - - [29/Nov/2015:16:56:33 +0100] "GET /index.php HTTP/1.1" 200 23788 "-" "Mozilla/5.0 (Macintosh; Intel Mac OS X 10_10_5) AppleWebKit/601.2.7 (KHTML, like Gecko) Version/9.0.1 Safari/601.2.7"
192.168.1.76 - - [29/Nov/2015:16:56:36 +0100] "GET /index.html HTTP/1.1" 403 518 "-" "Mozilla/5.0 (Macintosh; Intel Mac OS X 10_10_5) AppleWebKit/601.2.7 (KHTML, like Gecko) Version/9.0.1 Safari/601.2.7"
drwxr-xr-x 2 pi root 4096 nov.  29 17:05 .
drwxr-xr-x 3 pi root 4096 nov.  29 17:09 ..
this will give the owner (pi) read and write permissions, the members of the pi group and everyone else read permission. You can learn more about the commands I used by typing man chmod, and man chown at the command line. This will bring up the manual page for the commands with far more detail. You may also want to read the man page for the man command (man man). Not the answer you're looking for? 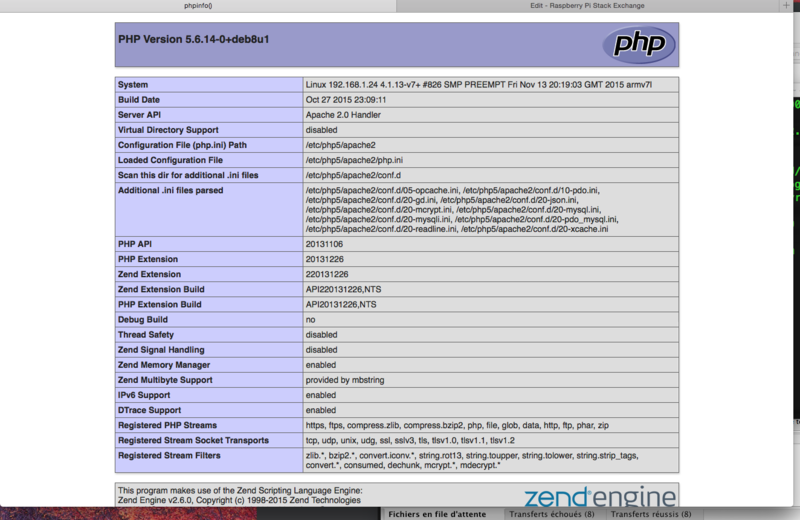 Browse other questions tagged php apache-httpd or ask your own question. How to merge port 80 and port 8080? How to set a permission to call a Python script from PHP?